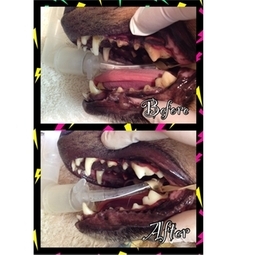 Canine and Feline dentistry is an important part of your pet's health. As part of your pet's annual wellness check we include dental checks. Many times in those checks we find signs of early tooth decay, gingivitis, and gum erosion that we treat using over-the-counter prescriptions. We also offer professional cleaning under anesthesia. This not only allows us to get the teeth clean and freshen breath, but also gives us the opportunity to do a much more thorough examination of each tooth. This lets us identify problem areas that may have been inaccessible during an office exam. All of our dental surgeries are bundled with cleanings.